I finally made a reproduction cart of the elusive homebrew game Mr. Splash! I love it. 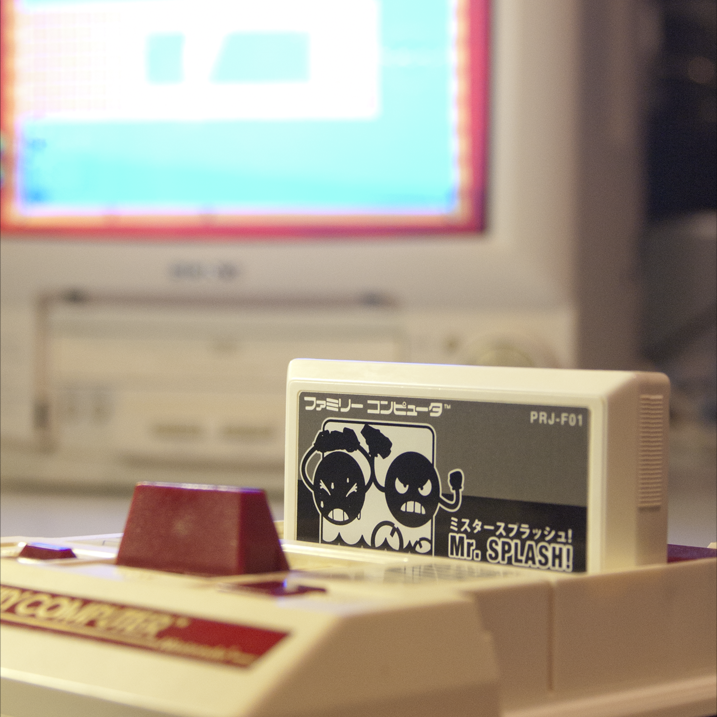 Rather than using the official art (which I couldn't find a good copy of) I designed my own label, going for a Game and Watch aesthetic. What do you think? 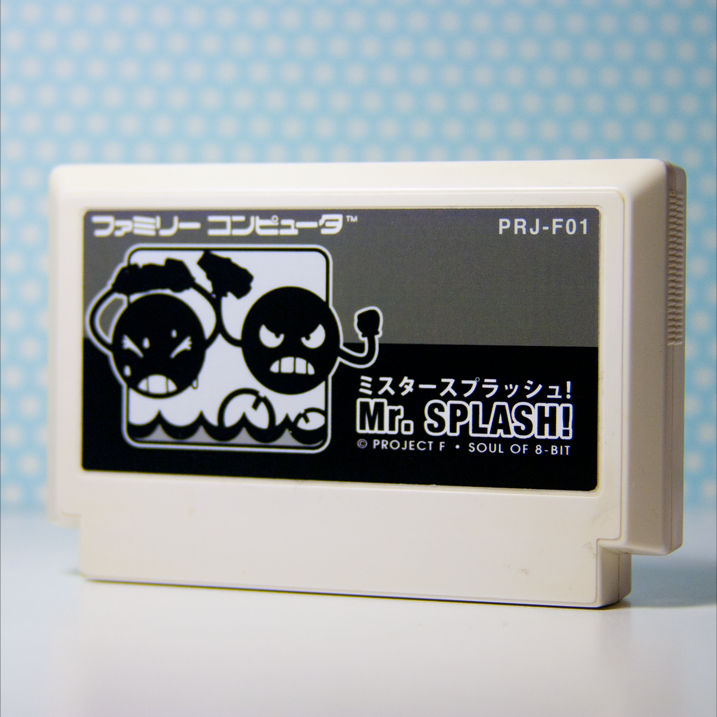 Mr. Splash is a 2-player only competition game created for a project called Game Generation X - Soul of 8-bit. 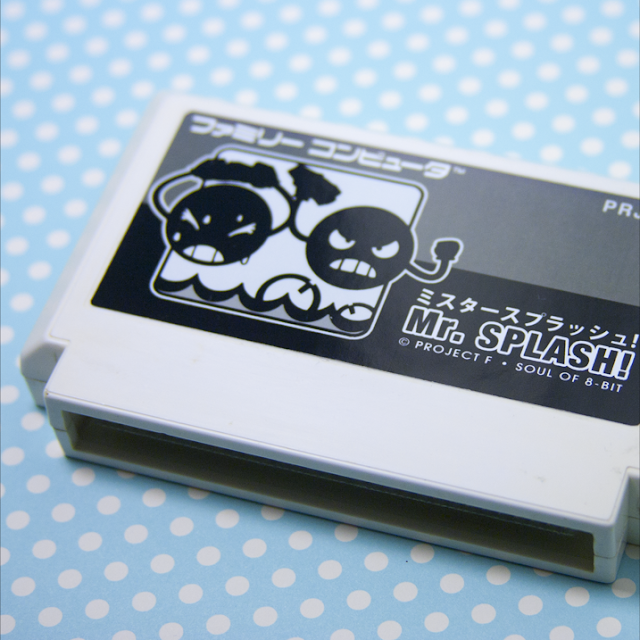 However, the developer Polygon didn't seem to want the game to be widespread--those who preordered the Game Generation X DVD box set got the materials to solder their own Mr. Splash Famicom cart, and these were apparently limited to 101 pieces. 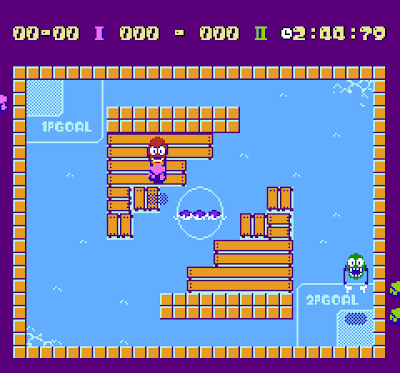 Some time later a run of 50 was produced for the NES in France, but a ROM of the game was impossible to find until 2011. Even now there don't seem to be a ton of them floating around but you can find it easily enough if you search. So let's talk about the game! It's sort of like hockey, but in a swimming pool. 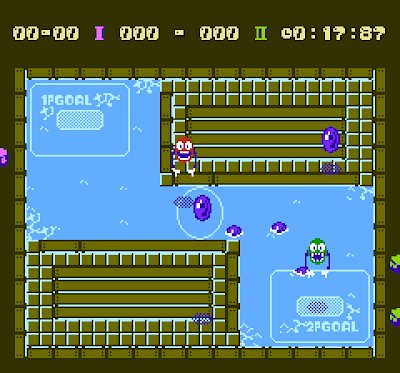 Your Mr. Splash must pick up rocks that spawn along the sides of the arena and hurl them into the water. The waves you make with your rock will move the floating balls in the water toward your opponent's goal area. What really impresses me about the game is the use of physics when it comes to how you move the floating balls. Chuck a rock right into the center of the ball and watch it go deep underwater and spring straight up; however, hit the ball off center and you can steer it toward the goal. Depending on how long you hold the throw button down, Mr. Splash will power up and throw it harder, altering the ball's trajectory in a variety of ways. You don't have to hit the ball at all, though! Plunk your stone down near a ball and the motion of the water will nudge it instead of launching it. Nudging a ball into your opponent's goal will earn you one point while launching it into the proper area will net you 3 points. A long shot can get you up to 6 points! It's a simple game, but the amount of work put into the play mechanics is impeccable. Turn the number of onscreen balls up to 5 and enjoy the chaos! There are also many versions of the game, apparently with edited arenas. The screenshots shown above are from the emulated "Columbia Version", though my cartridge is the vanilla Mr. Splash. I got most of my info on the history of Mr. Splash from this article at RetroCollect. Give it a look if you wanna know more. 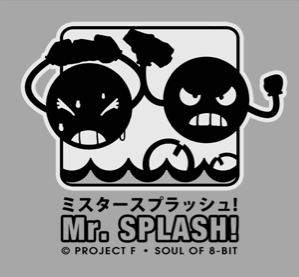 Has anyone played Mr. Splash yet? What did you think about this homebrew gem? I seriously thought this was a fake game until I saw that link. I wish I could play that game, looks way cool. Wait a second. This is real? I was just about to tell you how amazed I am at your ability to come up with stories for your fake games, Jeremy. Wow! Anyway, I LOVE your cart art. It's perfect! Sometimes truth is stranger than fiction, I guess! Maybe I should make a separate fake videogame news site to corroborate my actual fake games, haha. Thanks! Glad you like the label, I'm kind of obsessed with it lately.